These words from American writer Robert Gottlieb touch on the dilemma we face when critiquing art in all its forms. Football shirts, once a relatively niche area of the design world, are now arguably seen as an intrinsic part of communities around the globe. This has never been more apparent than in the past few months, where the launch of the new Nigeria shirt has sent shock waves throughout the footballing, and non-footballing, world. 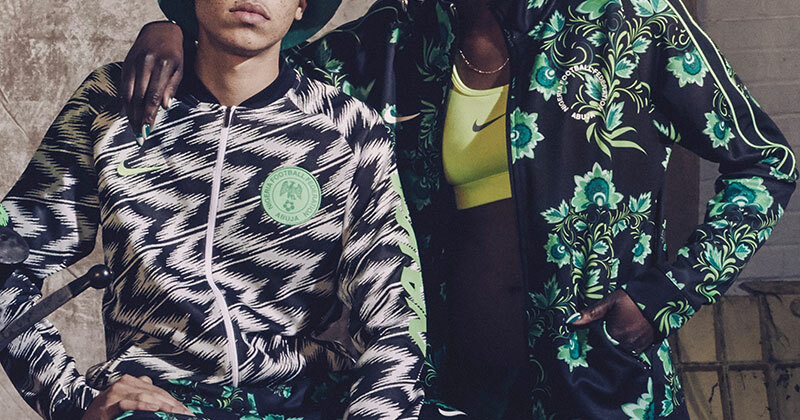 The new Nigeria tracksuit in all it's resplendent glory. Image by Nike. Is the popularity of the shirt simply a result of clever marketing? Are we actually looking at one of the greatest shirts of all-time? Some of these questions cannot be answered at such an early stage, where at the time of writing Nigeria are set to face Argentina in the most crucial of group stage matches at the 2018 World Cup. We can however acknowledge the factors that have contributed to what has been a perfect storm. When looking at the most notable football shirts in history, there is a thread which runs through almost all of them: success. Germany’s masterpiece from 1988 coincided with a golden period for the nation on the international stage. The Danish team of 1986 might not have won the World Cup, but the football they played was a perfect catalyst for the success and subsequent deification of their glorious half and half shirt. So how does the Nigerian team factor into this discussion? Surely it’s over the top to describe the Super Eagles as successful? In reality this team is the most exciting outfit the nation has had in years, and the ingredients of their players have combined to form something dangerous. The Nigeria squad are hungry. Image by Ross Cooke. Since the turn of the 21st century, there hasn’t been too much for Nigerian fans to write home about. A win against Bosnia and Herzegovina in 2014 was their only sign of a life at a World Cup since 1998. They didn’t even manage to qualify for the 2006 edition of the tournament. Qualification for the 2018 World Cup however signalled a new dawn. In a highly competitive group containing Cameroon, Zambia and Algeria, they finished firmly in 1st place with 4 wins, 1 draw and 1 defeat. This doesn’t even tell the full story, their solitary defeat against Algeria was as a result of fielding an ineligible player. The momentum of this campaign carried over to friendly matches, with the a 4-2 mauling of perennial foes Argentina last November forcing the world to take notice. They are by no means the complete team, but shining brighter than their inconsistency is the knowledge that Nigeria are capable of the spectacular. The team is the youngest at the 2018 World Cup, and whatever the outcome of their time in Russia the players and their fans are bound to leave an impression. Representing a continent. Image by Nike. It is also worth noting how Nigeria have filled a void left by the power shift in African football over the past few years. The resurgence of North African teams like Egypt and Morocco has left West African nations like Ghana, Cameroon and Ivory Cost (so often the flag bearers for football on the continent) looking from the outside in. Nigeria are an exception to this rule, helping them to stand out even more. The best football shirts encapsulate the culture they are representing. Sometimes this can be through the details of a shirt, where even stripes and patterns can help tell a story. Colours can evoke memories of famous moments for a team, and the voice of a community can be amplified through the medium of a kit. Naija is more than a nickname. Image by Nike. What Naija means to me is: Nai - the old Nigeria with a bad image because of corrupt ex-leaders and Ja - a slang for disappear. So when we say Naija, it means that we, the youth, are determined to cleanse the country and show the world the true colour of this great nation. Naija for real! The determination and attitude that accompanies Naija is intoxicating. For a place that has had its fair share of tragedy, it’s the kind of battle cry which even those outside the country can’t help but be moved by. What’s more, the rise of Naija has coincided with the historic success of the film Black Panther. Marvel’s record-breaking movie soared to become the 9th highest grossing film of all-time, in the process highlighting the beauty and ongoing importance of black culture in today’s world. Black Panther was as Vox described a “love letter to black culture”, and this letter captured the imagination of people around the world. 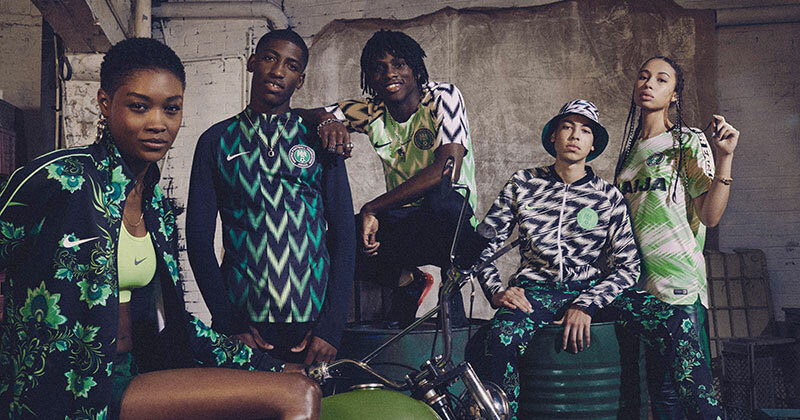 Whether Nike intended it or not, they created the perfect storm in celebrating Nigeria culture in a genuine way, at a time when everyone was beginning to take notice. With the launch of any new football shirt, you can expect the usual marketing fluff. Celebrity endorsements, gorgeous photography, viral videos. 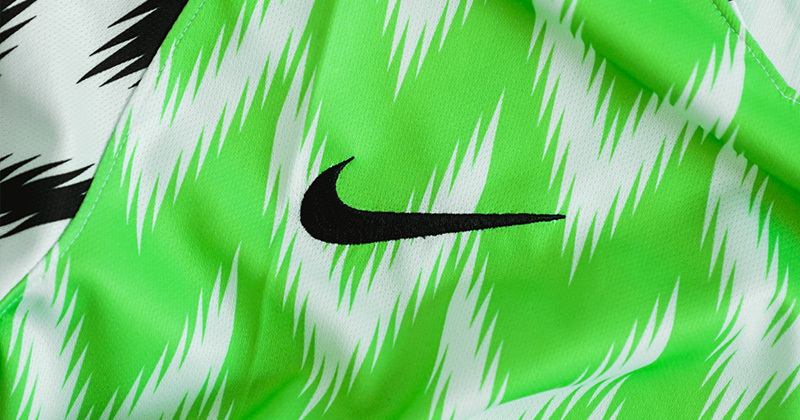 Nike did more than just shout about the Nigeria home shirt, they put time and effort into the whole collection, and made sure people were on the edge of their seats waiting for the release. In today’s world where you can find leaks for virtually every team’s shirt online, Nike and Nigeria beat everyone to the punch. Way back at the start of February (coincidentally just days before the UK release of Black Panther) a launch event was held to announce the Naija collection. Images of Alex Iwobi quickly circulated online, and excitement began to build. Not only did the shirt demand a reaction, but the tracksuits, bucket hats and drawstring bags that sat alongside it were even bolder than the home kit. Wavy in every sense of the word. Image by Nike. Fans were then made to wait for months until it’s official release. All this time, where grainy pictures and leaks would usually surface, the shirt continued to mature in the public’s consciousness. The wait only added to the anticipation, and a lot has to be said for how Nike handled this longer than average release timeline. 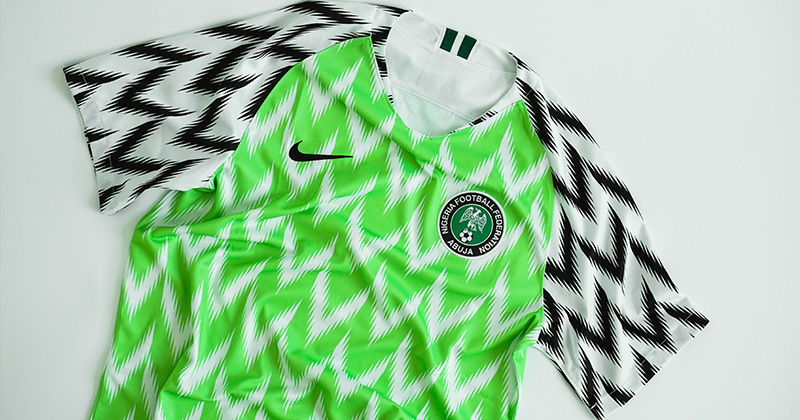 The rhetoric around the popularity of the shirt was wild, with the Nigerian football federation reporting their new kit had sold out with 3 million pre-orders. Whether the shirt actually had that many pre-orders is another story, but the hype that was built and the subsequent mad rush to buy the shirt once release day hit felt more akin to the launch of a new iPhone than a new football shirt. Nike and Nigeria got people talking week after week, and the public couldn’t get enough of it. Green is the colour this summer. Image by Ross Cooke. One day after launch, the Super Eagles also played a marquee friendly with England at Wembley. 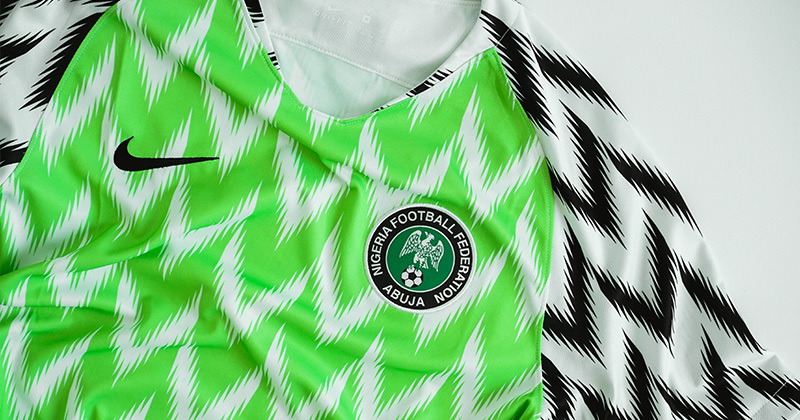 The shirt’s primary inspiration, Nike’s first design for Nigeria in 1994, was also worn in a match against England. This well calculated backdrop demonstrated the value in going beyond the expected trajectory of a shirt release. Nike teased, teased and teased some more to leave everyone desperate when the shirt finally flew off the shelves. Despite all that’s been said, none of these efforts would mean anything if the end product was not worth it. And that’s the best part, the Nigeria shirt is actually a superb creation worthy of all the fuss. 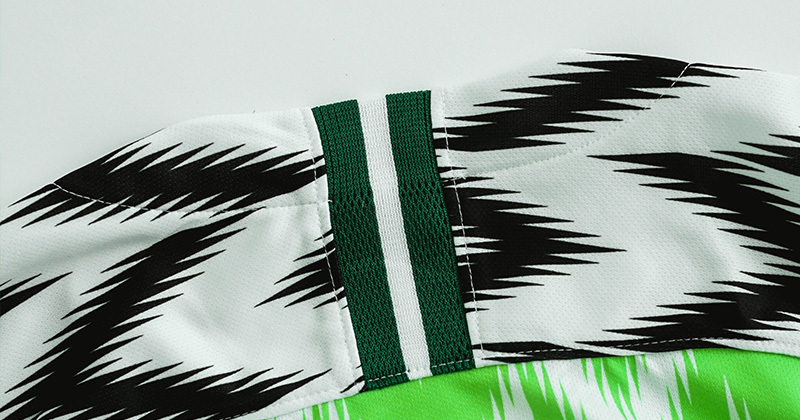 Firstly, the design of the shirt combines elements from the best of Nigeria’s previous home shirts. Nike rose to prominence in the footballing world in the 90s, producing shirts which pushed the boundaries of design. Their best work was often reserved for the shoulders of a kit, as evidenced by a template in 1994 (made famous by Borussia Dortmund) which came to be Nike’s first design for Nigeria. When both arms were lifted wearing that shirt, it was as if an eagle was spreading their wings. Sound familiar? 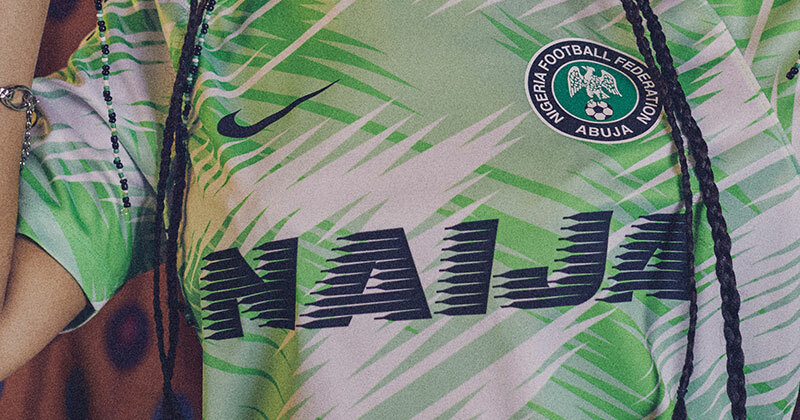 Nigeria’s nickname is of course the Super Eagles, and the 2018 shirt takes this idea and spreads it across the body of the kit as well as the sleeves. The Swoosh have returned to their roots. 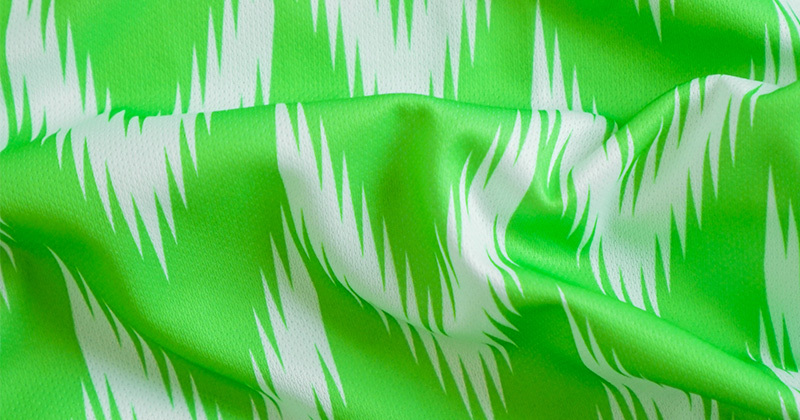 The colours are also a nod to a previous shirt, this time Nigeria’s kit from the 2002 World Cup. Back then a golden generation featuring the like of Kanu, Okocha and West was beginning to say goodbye, but their swansong was anything but subtle. 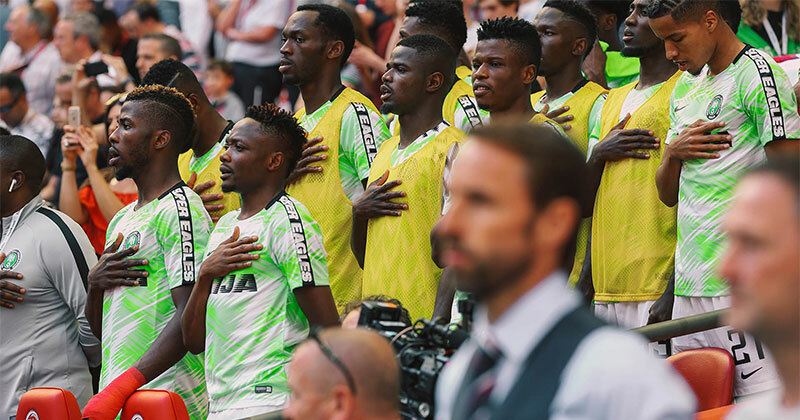 The fluorescent shade of green shining in the Japanese sun was the highpoint of an otherwise forgettable tournament for Nigeria, and it was a suitably vibrant choice of colour for Naija’s latest outfit. Another feature of the shirt is the fact the pattern actually continues around the back. It’s become a modern trend for the design of a shirt to be limited to just one area, (such as Nike’s latest shirts for Croatia, or even the pattern of the new Colombia home shirt from adidas) partly due to the restrictions brands are tied to. However, when a design breaks free of these limitations it stands out, and it’s a simple but effective move which harks back to the glory days of the 90s. A tasteful splash of dark green. 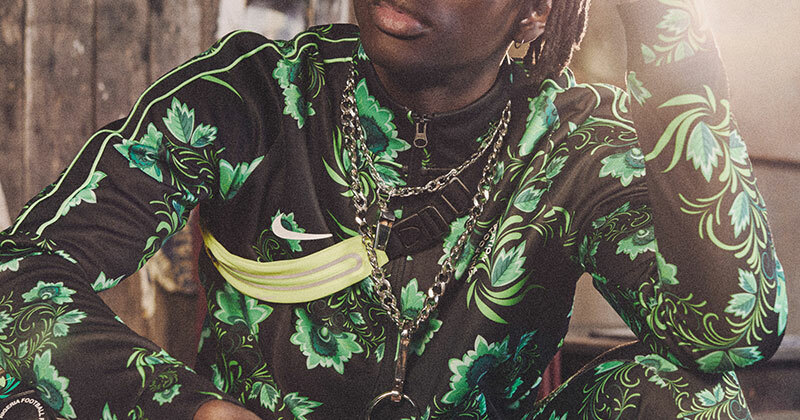 There are no gimmicks with the collar either, and a refreshing breakaway from the standard Vaporknit template used across much of Nike’s portfolio. Though the template actually has some great iterations (see Portugal or England), it’s another plus for the Nigeria shirt to not put placed in this bucket. It’s no secret many people have been enjoying what brands like Nike and adidas have brought to the table this summer, and it makes complete sense given the low point we reached just two years ago at Euro 2016, where almost every kit appeared to be from the same design stable. Amongst all the retro callbacks and fresh designs, Nigeria’s is arguably the boldest, and it is the poster boy for what will hopefully be a change in direction for an industry which looked doomed not so long ago. So how do we judge a shirt like Nigeria’s? Personal preference may be about as diverse as possible, but as we explored at the start, popularity and the clever choices that Nike have made force us to consider more than just these preferences. We won't forget this one. For me, this shirt is quite simply a game changer. 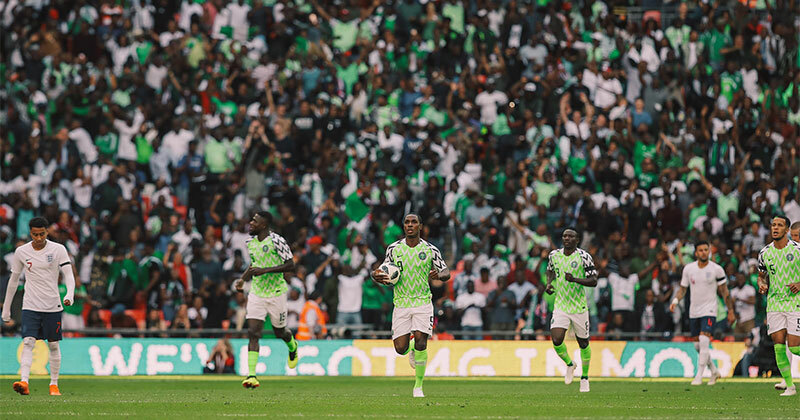 Websites, radio stations and personalities inside and outside the footballing world continue to talk about the Nigeria home shirt. This is a modern day Germany 1988, a shirt which will be looked back on for generations to come. If Nigeria make waves at the World Cup this summer, we will almost certainly be looking at one of the greatest shirts of all time. But even in they proceed to exit the tournament in inglorious fashion, this shirt will still stand tall. It’s path has already been carved, and all future shirts will be judged to a degree by what we are seeing with our very own eyes this summer.